Southeast Asian tropical peat swamp forests (PSF) are important for their large carbon stock storage and rich biodiversity. Therefore, the key importance of PSF to ecological processes, their resilience for forest degradation and logging highlights the need for a comprehensive forest monitoring in which LiDAR- and SAR technology may play an important task. Small-footprint LiDAR transects were acquired in August 2007 and 2011 using the Riegl system. The research transects are located at the Mawas Reserve in Central Kalimantan, Indonesia. The transects encompass an ecological peat dome gradient ranging from the river system to the peat dome. The transects faced in the past different forest degradation intensities. Our main objectives were to map changes in the vertical structure of the PSF with the multi-temporal LiDAR, in order to identify both sources and sinks of carbon across the peat dome-shaped gradients. In addition, TerraSAR-X time series were analyzed, whereas TerraSAR-X is a X-band SAR providing consistent and high repetitive coverage due to time and weather independent acquisitions. Subtle changes in the forest canopy are detected with TerraSAR-X due to the high-resolution and radiometric stability. 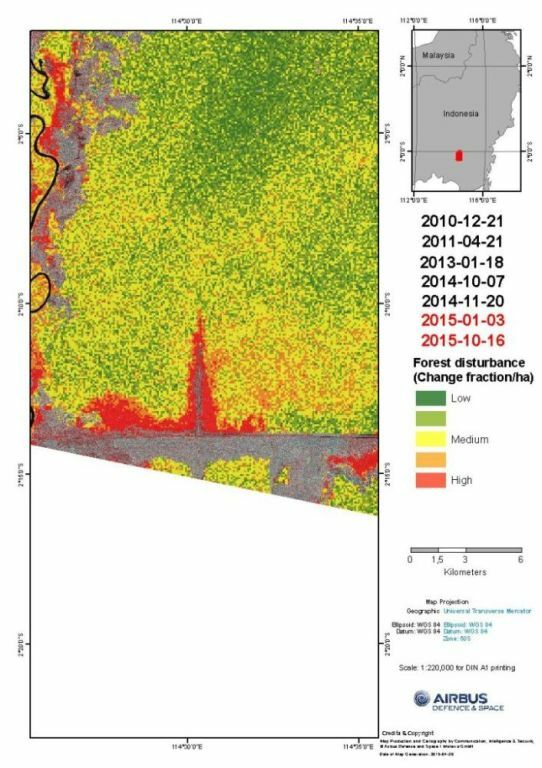 The analysis of TerraSAR-X data between December 2010 and October 2015 show forest logging activities mainly close to the forest edges and channels, where the loggers can transport the logs easily. Analysis of changes between January 2015 and October 2015 resulted in high forest disturbances exceeding the forest disturbance from the four previous years due to possibly increased illegal logging, but also to forest fires in 2015. Further research is needed in order to quantify forest degradation in larger regions in the Central Kalimantan. Tropical lowland ombrogenous peat lands in Southeast Asia are known for their rich biodiversity and huge amounts of stored carbon. In recent years, large natural areas of this endangered ecosystem has been converted into oil palm and rubber plantations. Hence, forest remnants are currently threatened by extensive drainage, logging, hunting and strong peat fire as in 2015. Remote sensing data can provide useful information in such environments for hydrological and wildfire modeling, retrieval of biophysical parameters and the management of natural resource. Multi-temporal airborne Light Detection and Ranging (LiDAR) data acquired in August 2007, and August 2011 were used to characterize the peat swamp forest in Central Kalimantan, Indonesia. In this study our main objectives were: a) to characterize ground-measured and LiDAR-derived biophysical properties of PSF and b) information from TerraSAR-X data to present an approach to carbon change assessment. The study area encompasses two LiDAR transects in Mawas test sites located in Central Kalimantan, Indonesia (Fig. 1). The Mawas area is located at the northeast part of block E of the Ex-Mega Rice Project (EMRP) (Figs. 1a, 1b) between river Kapuas and towards river Barito. Mawas km238 (south of equator) transects were partially damaged by peat fires during the El Niño Southern Oscillation weather effect in 1997 (Page et al., 2002, Usup et al., 2004, Hajnsek et al. 2009). The test sites are relatively flat. Estimates conducted by Jaenicke et al. (2008) using GIS techniques showed that the peat thickness varies from 0 to 18m at Mawas sites. The monsoon occurs between November and April and the average annual rainfall and air temperature are 2500mm and 25oC respectively (Usup et al., 2004). The selected LiDAR transects consist of altered primary forest patches, in which trees have been already selectively logged until the end of the 1990s. However, drainage channels (main and secondary) from the Ex-Mega Rice Project at Mawas are still being used for illegal logging activities up to date. Fig. 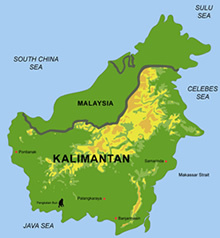 1 Location of the study area in Central Kalimantan, Indonesia. The yellow circle shows the location of the Palangaka Raya city. The solid yellow lines indicate the LiDAR transects a) and b). The LiDAR transects were surveyed twice by Kalteng Consultants and Milan Geoservice GmbH from August 5 to 7, 2007, and August 4 to 5, 2011, using a Laser Scanner System Riegl LMS-Q560. It was attached to a Bell 206 helicopter for the first flight and a BK117 helicopter on the second flight. The nominal height was in average 530m for both surveys. A differential global positioning system (DGPS) reference station was mounted at the airport of Palangka Raya city considering an elevation of 25.0m or 82 feet. The position and orientation of the LiDAR system on the helicopter was measured by an Inertial Navigation System (INS) and a differential GPS located on the tail boom respectively on the cockpit roof with 256Hz. A complete description of the LiDAR survey can be found in Boehm et al. (2008, 2013). The LiDAR transects were continuously monitored by the space borne SAR (synthetic aperture radar) satellite TerraSAR-X (partially as an acquisition of the close formation of TanDEM-X/TerraSAR-X). The acquisition dates used in this study are December 21, 2010, April 21, 2011, January 18, 2013, October 07, 2014, November 20, 2014, January 03, 2015 and October 16, 2015. The data were acquired in StripMap mode with a resolution of 3m in HH polarization. All images were co-registered and the intensity ratio of image pairs was calculated. Changes were detected on basis of the known distribution function of intensity ratio (Weihing et al. 2010, Poncet et al. 2014). Changes detected by TerraSAR-X in forest areas are mainly related to forest canopy disturbance due to the high resolution and low penetration depth of the SAR sensor. Therefore, any disappeared tree crown in the forest canopy can be reliably detected identifying even small scale logging or other disturbances. In order to assess the degree of forest disturbance, forest extent at the initial monitoring date December 21, 2010 was assessed with the SAR data using the amplitude and interferometric coherence of TanDEM-X with an accuracy of about 90% (Schlund et al. 2014). A regular grid with a grid cell size of 1ha within the forest area was created and the proportion of changes within each 1ha grid cell was calculated in order to estimate the degree of forest disturbance. Forest disturbance maps based on TerraSAR-X time series analysis showed mainly low to medium disturbance during the acquisitions of December 21, 2010 and January 03, 2015. Main parts of the Mawas area were low disturbed, whereas this could be assumed as natural mortality. However, forest disturbances generally increase to the forest edges. A large patch of medium to high forest disturbance was detected in south-eastern part of Figure 2 left. It could be assumed that the forest disturbance in these areas exceeded the natural mortality. The medium to high forest disturbance was mainly detected at forest edges and close to the canals, where logs could be transported easily. It is worth noting, that Mawas is a conservation area where the forests are supposed to be under protection. The forest disturbance map between the acquisitions of January 03, 2015 and October 16, 2015 revealed a substantial increase in the forest disturbance compared to the previous acquisitions.